I have never worked on intarsia knitting before. I do not know if I was to scared or just didn't have the desire to keep track of all the little balls that you have when you knit color sections. Even knitting in fair isle or stranded color work, seemed easier to me. 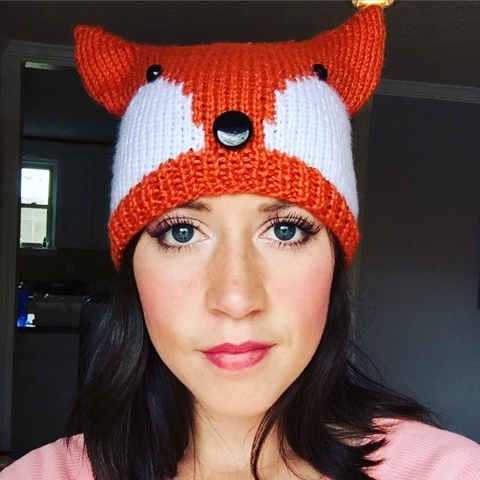 But I had to make this adorable fox hat for a project and I did not like any of the patterns I saw. I loved the look of some, but the construction looked so complicated that it didn't interest me because I was on a time crunch. Even though the line of the nose where the white and orange meet, are not seem less and looks more like cross stitch, I think it is absolutely adorable. I love those tiny bead eyes. Of course now all my children want one with a different animal. Maybe I should make a pattern set with animals. That would be fun!